It seems like fall weather has finally settled in here in the Northeast. Fall means soccer Saturdays, cozy sweaters, knee high boots and and of course pumpkin spice lattes. Nowadays, the love for pumpkin goes beyond the latte and pumpkin can be found in the grocery store in everything from soup to beer to ice cream and yes, even tortilla chips. Believe it or not, pumpkin is a fruit and it runs in the same family as winter squash. Not only is it nutrient dense, it is very versatile and can be added to many things sweet and savory. The most popular type of pumpkin is the one that gets carved for Halloween. While whole pumpkins can be messy to carve and complicated to cook, canned pumpkin provides a great alternative with no added or artificial ingredients. Make sure to choose canned pumpkin in lieu of pumpkin pie filling which may look similar but can be loaded with added sugar and calories. One cup of canned pumpkin contains only 80 calories and as much as 8 grams of fiber or about ⅓ of the entire daily recommended value of fiber. Foods rich in fiber and low in calories can be very filling. Additionally, pure pumpkin contains no fat, no cholesterol and only 8 grams of sugar. Just one cup provides more than 100% of the daily recommended value of Vitamin A, 16% of the daily recommended value of Vitamin C and over 20% of the daily recommended value or iron. Pumpkin also contains powerful antioxidants and altogether the benefits can include helping boost immunity, promoting heart health, and protecting your skin against the sun’s harmful rays. Make a Pumpkin Pie Protein Smoothie by blending ½ frozen banana, 1 cup milk of your choice (we prefer unsweetened almond), 1 cup canned pumpkin, 1 scoop vanilla protein powder, a dash of cinnamon and a dash of pumpkin pie spice. If you prefer your smoothies on sweeter side, you can always add in the other ½ of your banana or drop in a tablespoon of pure maple syrup. If your smoothie is too thick, you can always add in a splash of milk at a time to achieve your desired thickness. Whip up breakfast in advance with our Pumpkin Overnight Oats which are not only filling, but also convenient for those mornings when you are running out the door. Pop them in your bag and enjoy on the go. 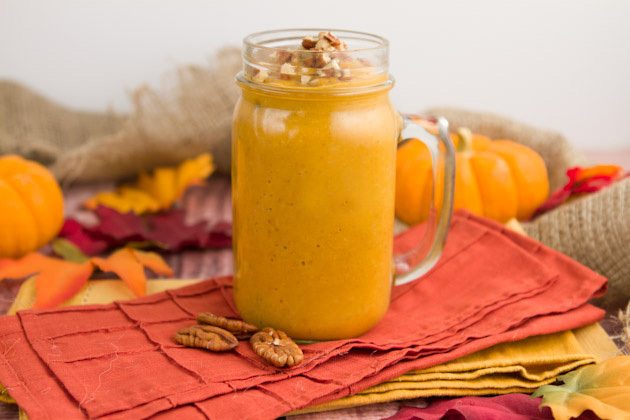 Add the following to a small mason jar or tupperware: ½ cup rolled or old fashioned oats, ½ cup milk of your choice, ¼ canned pumpkin, a splash of pure maple syrup or vanilla extract, a dash of cinnamon and a dash of pumpkin pie spice. With the lid on, shake to combine, and place in refrigerator overnight or for at least 6 hours. For extra flavor and crunch, top with a sprinkle of crushed pecans or almond slivers. For dessert, scoop yourself a Pumpkin Nice Cream Sundae by combining 2 or 3 frozen bananas, ½ cup nut butter of choice, 3 tablespoons of canned pumpkin, and a dash of cinnamon in a food processor and blending until smooth. Store in the freezer for 30 minutes. Top with a few chocolate chips or even a drizzle of maple syrup. Create pumpkin flavored pancakes or waffles by dropping a ¼ cup of canned pumpkin into to your favorite pancake or waffle batter with a dash of cinnamon, a dash of pumpkin pie spice, and a splash of pure maple syrup. In the event you do channel your inner artist and carve yourself or your family a pumpkin, don’t forget to save the seeds. Like canned pumpkin, pumpkin seeds are nutritious and provide health benefits that can include zinc for immune support, magnesium for heart health and plant-based omega 3 healthy fats. Ditch the Diets. You Heard That Right! Love this! Very informative and love the creative ways to add pumpkin into recipes! Definitely going to try the smoothie! Looking forward to more articles like this! Keep up the great work! I am not crazy about pumpkin but I am open to trying these suggestions! Keep the ideas coming!